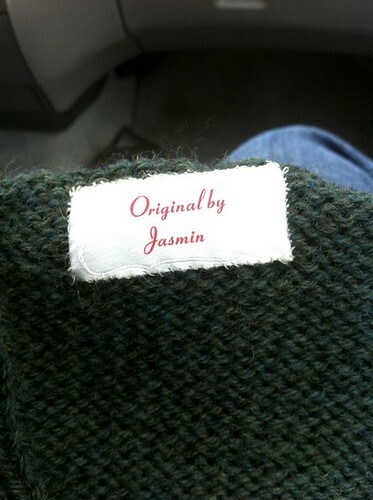 Last year, Meghan knit a beautiful sweater for herself. Unfortunately, it was Way Too Small for her. It happens. When she mentioned on her podcast that it was Way Too Small and was debating a course of action for her (basically) finished sweater, I pinged her and asked if she thought it would fit me. After a brief moment, she said, "Yes," and I offered to knit her a sweater in exchange for the one that didn't fit her. She sent me a gorgeous sweater, which is very Meghan. Meghan has the kind of style where she can throw clothes together and look stylish. If I do that, I just look homeless and usually colorblind. But look at this gorgeous thing! It's fun, and matches a TON of stuff in my wardrobe. 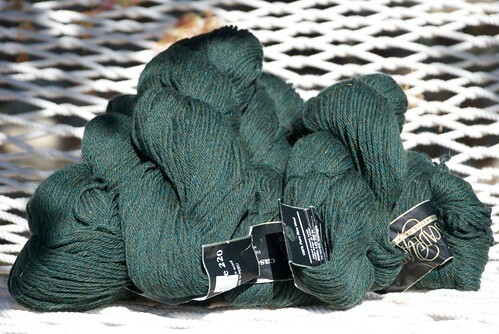 After some discussion, Meghan chose the Twist cardigan (by Bonne Marie Burns, who is a genius) in a heathered hunter green. 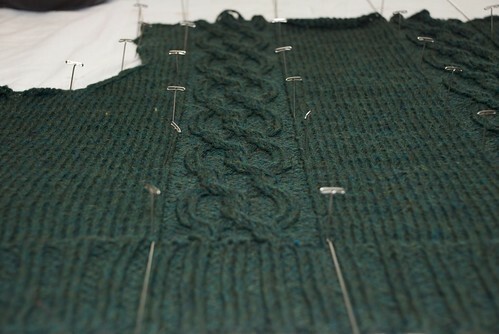 Then began the sweater. And the taunting. As I made progress on the sweater, I learned a few things. The first was how to drop down and fix a cable without ripping back on the sweater. The second was a reminder on how much I LOATHE sewing in sleeves. But you know what I do love? 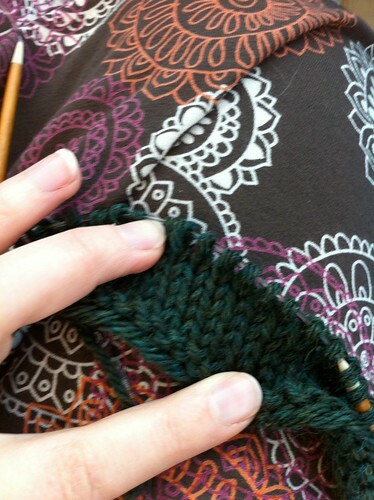 Knitting ribbing and cables. This shade of green makes me think of the drive up to Oregon. Woodsy. 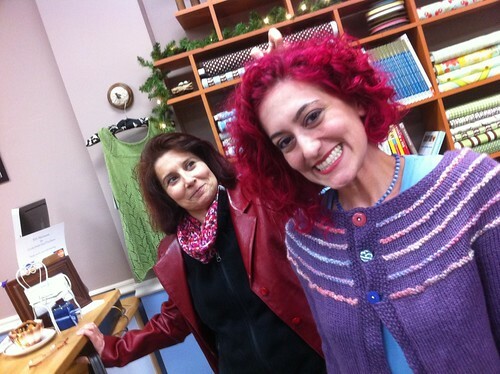 This sweater traveled all over creation with me while I worked on it, and I LOVED knitting the body. Terrible color. I'm blaming the piano, where I chose to photograph it. I can't even tell you how pleased I was to finish the body, and how proud I was when I pinned it to the bust. I might have left it there for a while and admired it whenever I walked by it. This picture makes me think of a figurehead. For the SS Kay. The body of the sweater felt like it was FLYING off my needles I was working it so fast. The sleeves? Not so much. It's not that knitting sleeves is hard. I think it's mostly that the bloom is off of the rose with the garment at that point**. There is also the needing to knit two-ness of it. I usually knit my sleeves two at a time using the magic loop technique, but I didn't for this sweater. Mostly. 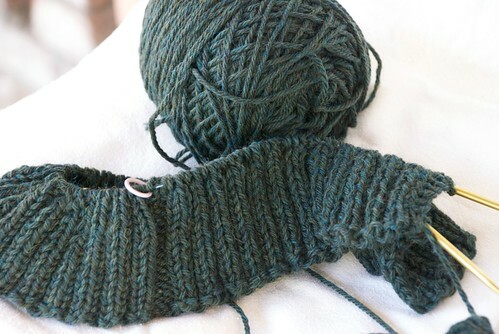 I started them two at a time, but between the tangling of the yarn, the turning the cables without a cable needles, and the general ennui caused by the knitting of sleeves, I decided to take a couple of the (possibly emotional) roadblocks out of knitting sleeves. 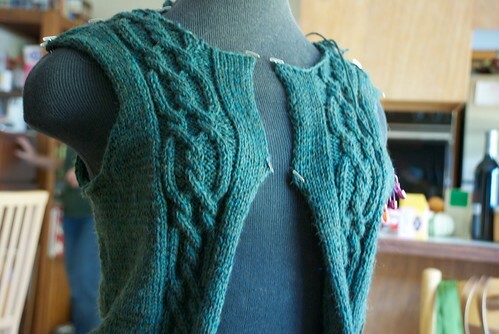 You know I don't like knitting sleeves because there are ZERO photos of the sleeves in progress. The sweater sat and sat and sat, pieces all knit, waiting to have the sleeves set in. I kept putting it on my to-do list, and *somehow* I managed to forget, or run out of time, or pretend that I had forgotten and ran out of time. 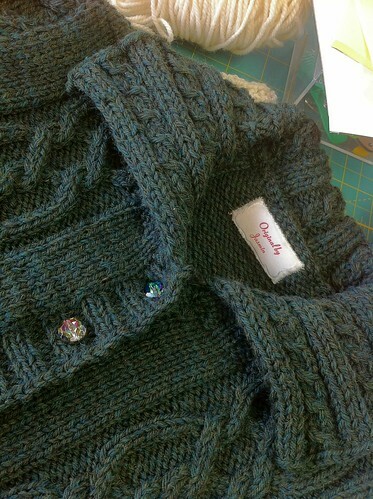 Chloe knew about the sweater, knew that the pieces were done, and has always knows how much I *loathe* finishing work. I had fresh cookies at the house, and Chloe informed me that she would be coming over and setting in the blasted sleeves. T-minus one week to Camp KIP. And then, the finishing FLEW. I knit the buttonband, found a volunteer with Meghan's bust size so that I could place the non-negotiable buttons, Mom sewed in the grosgrain ribbon while I did our laundry and got prepared for Camp. I sewed on the buttons, which I bought at the Button Emporium, and used buttons that looked like little pewter balls of yarn for backing buttons, and one lone sheep. I redid the buttonholes four times. Each fancy buttonhole I tried was too much for the perfect little buttons. 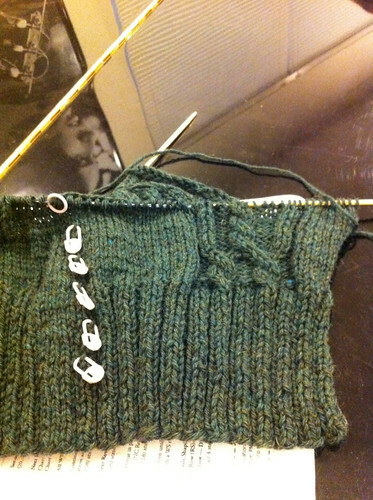 With great regret, I fell back on the YO, K2tog buttonhole that I learned so many years ago, when I was knitting my first sweater. It was a perfect fit for the sweater. It just needed *one* more thing. I sighed a huge sigh of relief, tossed it in my backpack, and the sweater joined us on our adventure to Camp KIP. She likes it! Meghan likes it! **One exception: unless the sleeves are the interesting part of the sweater. See: Mariah hoodie. I love that I heard about this sweater on two podcasts and now can see its whole evolution in one post! Any tips on setting in the sleeves? I'm getting to that point on my handspun sweater, and I've never set in sleeves that were knit in the round before, so I'm a little scared. Entirely spiffy. I suspect the sweater anticipation (for all of us) was definitely enhanced by the taunting. The sweater is lovely and Meghan looked quite tickled.